Please remember, wool is a natural fibre and has a strong element of flexibility. If your garment feels slightly small at first, give it a gentle stretch which will loosen the fibres in a way that will not damage the garment or cause it to lose its shape. 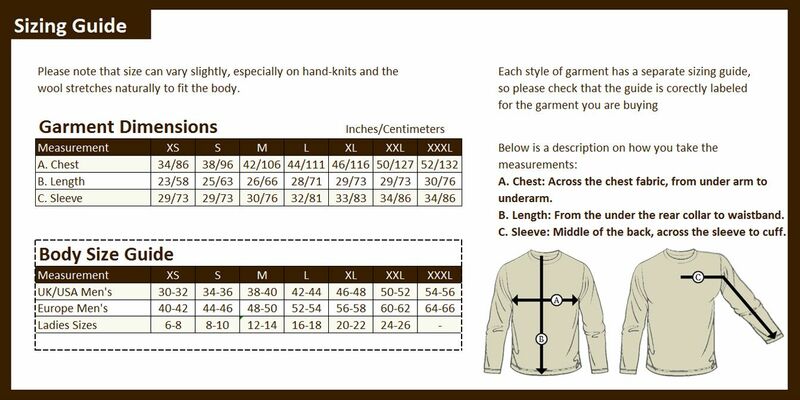 Where a specific size is available for a garment: To calculate the size sweater you require simply measure across the chest of your favourite sweater in inches and double that value. Secure, Fast Delivery by DHL Courier with excellent tracking system provided. See our Express Shipping page for full details. Sign up to receive 10% off your first order and keep up to date with all our exclusive offers and news.